Posted by Jon in Indie, Review, Toys with 1 comment. I’m one of those people that will buy an entire action figure if it comes with a cool accessory, especially if that accessory is food. This is probably why I’ve hoarded away a stash of Marvel Legends Pizza Spider-Men and Deadpools. So, imagine my delight when I found out I could get not one, not two, but eighteen food accessories for the price of one Marvel Legend! Happycat Industries has teamed up with Zag Toys on a project that is very near and dear to my heart: six-inch scaled food accessory packs. 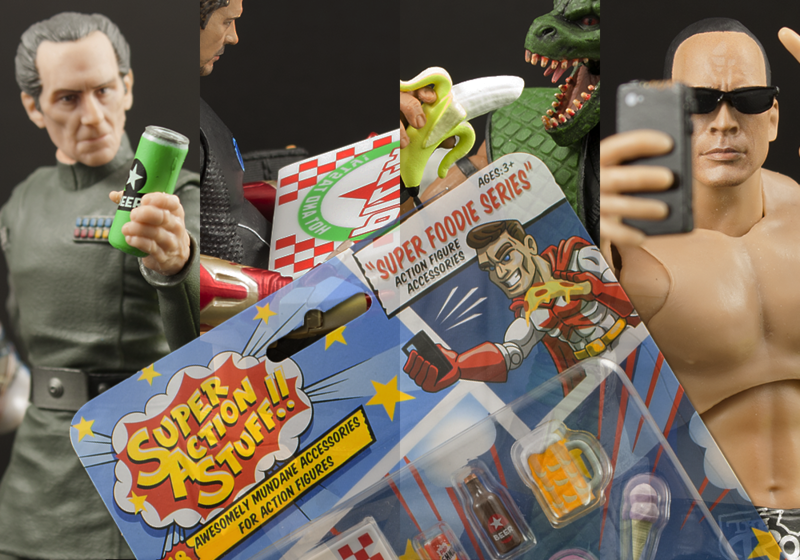 The Super Action Stuff ‘Super Foodie Series’ is a collection of 18 food-related accessories for you 1/12 scale action figures. The set includes a shawarma (one of those things the Avengers ate at the end of their movie), donut, can of soda, hot dog, bottle of beer, slice of pizza, apple, ice cream, taco, water bottle, mug of ale, turkey leg, bottle of whiskey, chimichanga, pizza box, can of beer, and a phone (technically not food, but how else can you selfie your meal?). You can currently grab these sets off of Amazon, and the price tends to fluctuate between $19 – $20 with free Prime shipping. The price is great for what you are getting here. I also appreciate the humor that went into each item’s description on the back of the page. It’s easy to see that these guys are big time toy fans. Everything in this pack makes sense, and at some point in time I’d wished my Marvel Legends figures had them. Now they do, mission accomplished! These accessories are a natural fit for comic Marvel Legends. I did have a few concerns when I first got these, that they may be a little too cartooney for my movie figures like Star Wars and MCU Marvel Legends. Surprisingly, they fit in pretty great! Grand Moff Tarkin looks great kicking back a can of beer after a long day of destroying planets. Even the Figuarts feel right at home with them. I’m always looking for viable accessory options for my 6-inch scale collection. Especially options that don’t involve me buying an entire figure to get them. Happycat has put together a great product for prop fans like myself. I’m pulling for them, and hoping that there is enough demand to warrant a new set in the future. It would be great to see what they come up with next. I wouldn’t hesitate to grab a set of these Super Foodie Accessory Packs to enhance your display shelf. This set was a ton of fun to play around with, and you are most likely going to see them littered all over my future reviews. Hell, look at just how much milage I’ve gotten out of the Duke Nukem bust! As I mentioned previously, you can grab a set of these off of Amazon right now. Become the Foodie you were born to be! ** Review samples were home-baked and provided by Happycat Industries for this review.